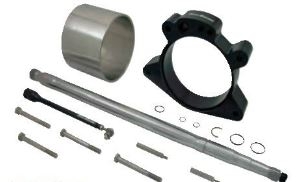 Riva’s race bred pump extension kit increases top speed (1~2mph), hook-up and drive in all riding conditions. Billet aluminum spacer installs between transom plate and pump housing extending the intake tract 50mm delivering greatly improved pump efficiency. Precision machined extended stainless steel wear ring provides improved performance through tighter tolerance and increased durability. Supplied extended billet drive shaft is CNC machined to exact tolerances and heat treated to increase strength. Includes extended VTS Rod, stainless steel steering and reverse cable extensions, and detailed installation instructions. This modification is a must for all forms of competition including closed course, off shore and drag racing.